It’s been about four months, so I feel the need to explain myself! I took the summer off (well, kind of) and flew halfway across the world to attend culinary school. I’ve never taken any formal cooking classes so I didn’t really know what I was getting myself into, but over thinking is what always gets me not to do things, so without really thinking about it I just applied, bought a plane ticket for me and my daughter and went on my way. It was honestly the best thing i’ve ever done, and I’ve learned so much it’s insane. Just being in that environment, surrounded by such talented chefs and teachers, seeing how a restaurant is run during classes (the restaurant kitchen was just a glass wall away from the school), I’ve come back (so cliche of me) with a completely different perception of the kitchen. But although I was in the kitchen for most of the day, pouring over recipes and making up to six things a day, when I got home I didn’t have to go into the kitchen and cook dinner, so coming back home to Chicago and taking the reigns again has been a bit of a challenge. Believe it or not if you’re not responsible for getting groceries or choosing what to make everyday for your family, you forget the simplest of things. I’ve been back for five days, and i’ve gone to the grocery store every single day because I keep forgetting basic ingredients that I have always had in my pantry and fridge! 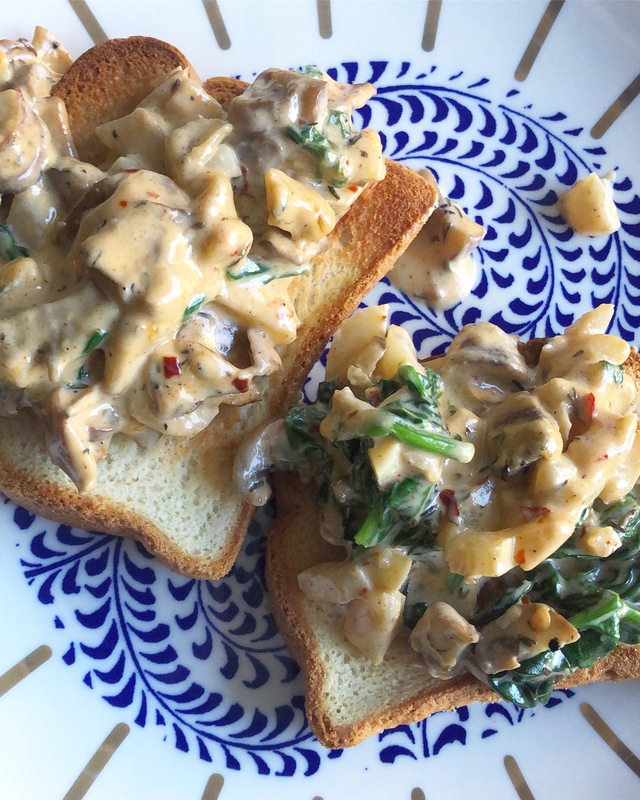 But let’s move onto the mushroom toast now, because I happened to have enough ingredients for it and honestly, mushroom toast is so versatile you can really add anything to it. It’s also extremely delicious, with various textures working together to give you the ultimate snack, and great for parties too, to be honest. I’m also trying to cut down meat and gluten from my diet, so loading up on veggies and gluten free bread is now my favourite thing. Heat the olive oil in a pan and sauce the mushrooms till they’re golden brown. Add the spinach and chestnuts and sauce for a couple minutes till the spinach wilts. Then add all the seasonings and the cream and cheese. Cook until the cheese has melted. Toast the bread in a toaster, on a pan or in the oven and generously top each one with the mushroom mixture. Enjoy warm.